Nearly 3000 years ago this was the place that transformed Prince Siddhartha to Lord Buddha giving him enlightenment and thus a birth of new religion, Buddhism. After experiencing severe austerities for six years, Prince Siddhartha realized the futility of such penances to find the ultimate truth for salvation of Human kind. He had wandered enough. He chose to sit under a Bodhi tree in meditation until he found out the true path to salvation. Not caring of his physical needs, he meditated for 45 days and it was then that he was enlightened and the realization of the cause of sorrow and path of salvation dawned upon him. Since then Bodhgaya has become the place where the story of Prince Siddhartha ends and saga of the world's greatest teacher begins. Bodhgaya thus continues to be the site of utmost importance to the Buddhists and apart from being a vital Buddhist centre also happens to be an important archaeological site. People from far and wide come here to pay their homage to the great world teacher. They come here to learn more about Buddhism and its doctrines and also to learn the art of meditation. 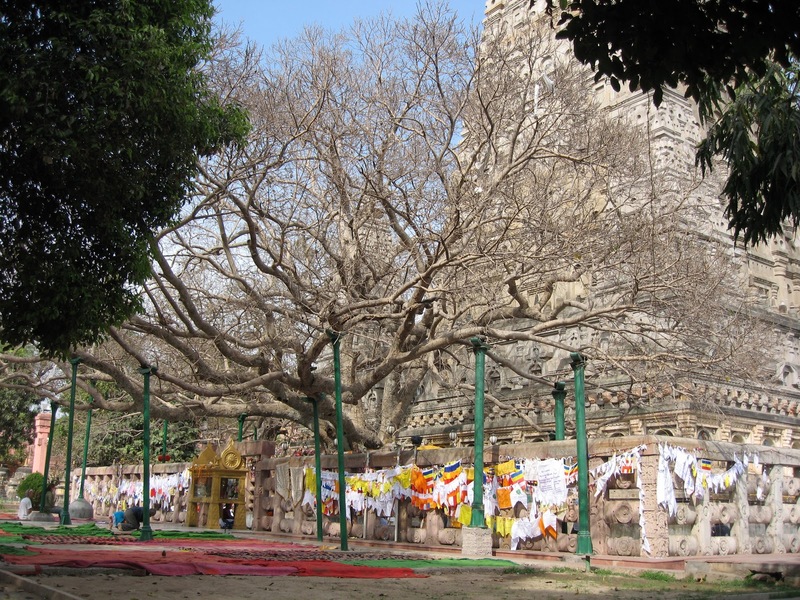 The focal point of Bodhgaya is the Mahabodhi Temple. This 50 meter high temple was originally built by Emperor Ashok in the 3rd century B.C. after he became the follower of Buddhism. The temple was destroyed and resurrected many a times. But the present structure is said to be around 10 centuries old. 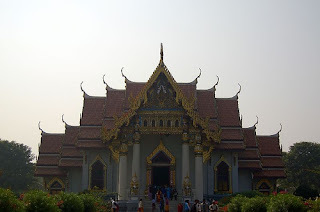 This temple complex has the famous Bodhi tree under which Buddha attained enlightenment. The original tree died long back. A sapling of the original tree was taken to Sri Lanka by the daughter of Ashok, Sanghamitra. She got it planted in Sri Lanka. The present tree at Bodhgaya is the sapling of that tree in Sri Lanka. Emperor Ashoka also erected a diamond throne shrine at this spot with a canopy supported by four pillars over a stone representation of the Vajrasana, the Seat of Enlightenment. Inside the temple there is a colossal image of the Buddha in the Bhumisparsha Mudra; Lord is shown touching the ground. The temple is surrounded by a small pillars and delicate lattice work. Apart from this main site the small town today has many monasteries built by various Asian countries in their own architectural styles. All these monasteries are meant for learning Buddhism and are patronized by the people from those particular countries. Location: Bodhgaya is a small village in the eastern state of Bihar, is situated near the Hindu pilgrimage centre of Gaya. 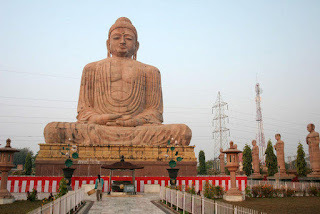 Around 11 kms from Gaya, Bodhgaya is around 105 kms from the capital city of the state, Patna. The sleepy village has grown to prominence today as one of the most important Buddhist pilgrimage sites of the world. The best season to visit Bodhgaya is in the winter months when the air is cool and pleasant. This dusty village situated on river Falgu, earlier known as the River Niranjana, is one of the most sacred sites in India. 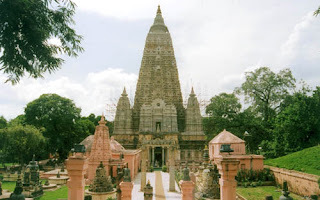 The town of Gaya is very near to Bodhgaya and is one of the important Hindu pilgrimage centers of India. According to a legend, Lord Vishnu gave Gaya the honours of forgiving the sinners of all their sins and purifying them in every way if they give offerings to their ancestors and take a dip in River over here. The temple of Vishnupad, where Lord Vishnu is believed to have ascended and his foot is printed in that place, also attracts huge crowds of devotees. Most probably built during the time of Mauryan emperor Ashoka; these caves are carved out of solid rocks which bear details of the life of Buddha. The caves consist of temples and sanctuaries hacked out of huge granite outcrops and are designed to look as if they have been made of wood. The four caves have names each and are different in their own way. The Lomas Rishi Cave, which is sculpted to resemble lattice screens, is the first available example of the famous Buddhist Chaitya Arch style in India. The entrance is in Egyptian form and only walls of the outer rooms are polished. The Sudama Cave, known in ancient times as Nigoha Kubha or Banyan Tree Cave. It is made during the 2nd century B.C. The cave has two chambers and the interiors are having highly polished surfaces. The Karan Chopar, a single-chamber-structure with a vaulted roof and simple opening also carved out during the same time has an inscription saying the name of the cave to be Supriya cave. The Vishva Zopari Cave is the last two chambered cave also carved around the same time. The Gopi Cave which is the most important and has a number of inscriptions on it. A number of inscriptions have been found here. It is believed that in the middle of 19th century, some Islamic saints used to live in these caves. The other two caves are the Vapuiyaka Kubha and the Vedathika Kubha. Apart from the main temple of Bodhgaya, there are many temples and monasteries built in various architectural styles. These monasteries usually patronized by foreign countries'' Buddhist organizations such as Japan, Korea and China, are the main centers for promotion of Buddhist studies. Today the small town of Bodhgaya is full of many such monasteries which bring people from far and wide to take classes in Buddhism. Mahamaya Hotel Bodhgaya is in a good and peaceful location, quite suitable for all guests coming to Bodhgaya. Either you come here for business purpose or sightseeing, you can relax in this comfortable hotel.A warm greeting, a welcoming smile and dedicated reception at the hotel lobby offer you an experience of visiting and staying at the hotel. The Hotel is Centrally located and Nikko at the World Heritage Site of Bodhgaya combines, Hotel Has 32 Rooms Consisting of 30 Double and 2 Suites with Business Centre, meetings and conferences. Royal Residency is a symbolic hotel erected on 3 acres of land in the best environment. The hotel has state of the art facilities and services to cater to the diversified needs of the business and leisure travelers alike. The hotel has all modern facilities including spacious lobby, shopping arcade, airline offices, a bar and a multi cuisine restaurant.